If you don't already take an hour long shower, now you will. 1. 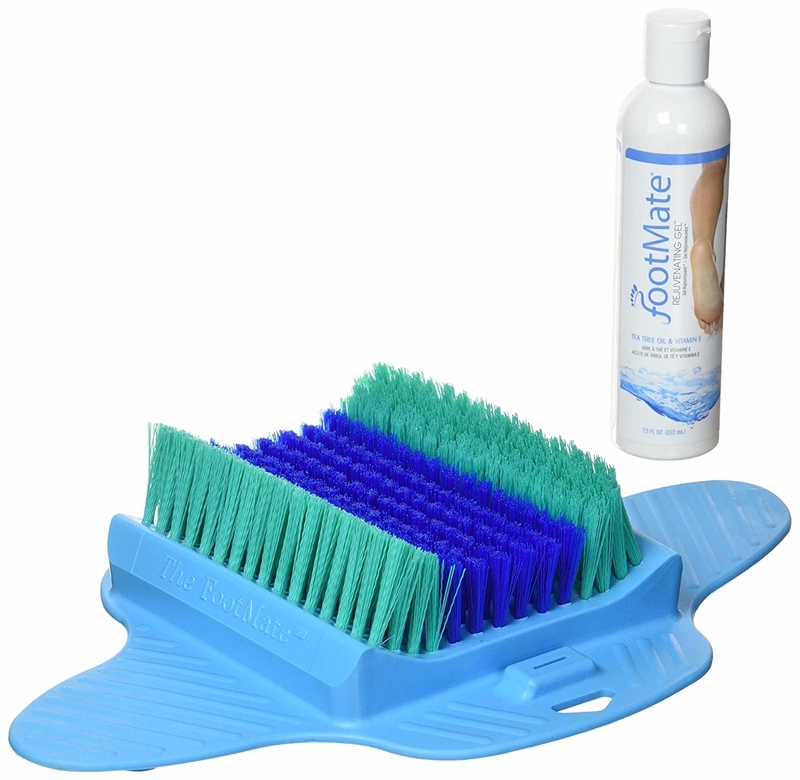 A foot massaging/scrubber with a rejuvenating gel for giving your feet a five star spa treatment right from the comfort of shower. Designed with a gentle inner brush to soothe the soles of your feet, with firm outer bristles to treat rough skin. Helps to reduce foot odor, block toxins, and speed healing! Comes with the foot massager/scrubber and a rejuvenating blue gel. 2. A mildew-resistant shower curtain liner so you can have some peace of mind knowing yucky smells won't build-up on your curtain liner, and need replacing. This liner is made with non-toxic, chlorine-free PEVA. 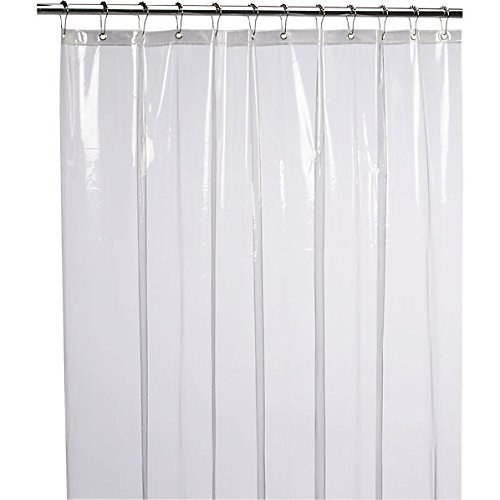 This will fit any standard-sized shower/tub and works with both straight and curved shower rods. It can be used as a liner, or even as a stand-alone curtain. It comes with 12 rust-proof metal grommets and a reinforced header to prevent tearing and ensure functionality. Claims to last four times longer than competition products! 3. 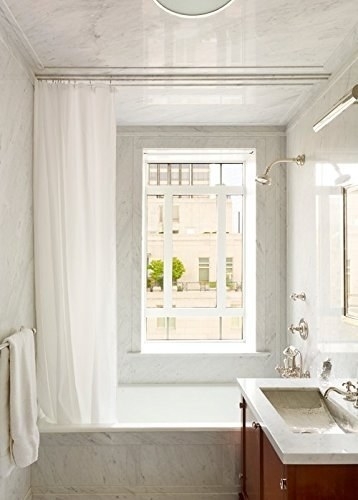 An ombre shower curtain that'll add a subtle yet trendy design in any bathroom. HGTV is literally shaking. 4. A fogless mirror for when you're shaving in the shower and wanna actually SEE your reflection, and not some clouded-up version of your shaving cream–covered face. Includes a shelf with hooks to hold onto things like a razor or a loofah! It can be rotated 360 degrees and is easy and quick to adjust while shaving, tweezing, and removing makeup. Plus, the mirror is shatterproof, rustproof, and can adhere to any bathroom wall easily without worrying about it slipping or sliding off! 5. A shower/bath grip to help maintain balance on slippery flooring. Showers, tubs, and the wet floors outside of them are accidents waiting to happen. It never hurts to use caution. 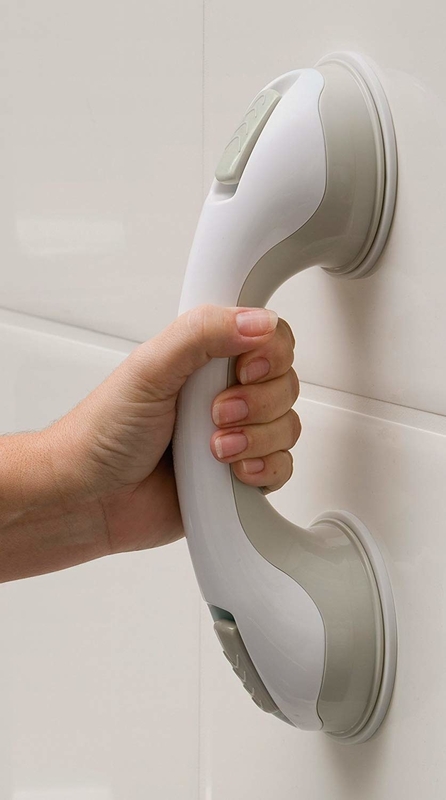 To install, simply apply pressure to the handle while flipping the latches down. To remove, just release both latches and slide a fingertip under the rubber seal at each end. 6. A squeegee so you can dry your shower doors, walls, mirrors, and other moist surfaces without leaving behind streaks. Features a durable, flexible blade that makes for fast, streak-free drying. The suction hook allows for easy storage. It also has a soft, comfy, non-slip handle! 7. A waterproof note pad for jotting down all of the Einstein-like ideas we all seem to come up with while standing in the shower, but immediately forget the second we turn off the water. 8. A memory foam bath mat to absorb the water from your wet feetsies when you step out of the shower — it's so soft and comfy, you're gonna want to buy one to put in every bathroom in the house. 9. An eight-piece towel set that'll feel soft against your skin and make a great addition to any bathroom! Includes two bath towels, two hand towels, and four washcloths. Recommended to machine wash towels in warm water with mild detergent and then tumble dry low — dry immediately after washing to minimize mildew. Don't use with bleach, fabric softeners, or an iron! 10. A shower dispenser for a fancy schmancy way of getting out your shampoo, conditioner, and body wash while cutting back on bottle clutter. 11. A TubShroom so you can catch your hair (and more importantly stop clogged drains) — because no one wants to deal with that shiz. 12. A four-pack of loofahs to exfoliate and cleanse skin and pores so you step out of the shower feeling smoother than a fresh jar of Skippy. 13. A non-slip bath mat that'll stay firmly suctioned on the floor of your shower/tub so you can rest assured you and your loved ones won't take a fall. This is machine-washable! Just hang and air dry afterwards! 14. An anti-residue shampoo with a cult following suitable for all hair types. Now every time you wash your hair, you can feel as if you just left the chair of the rinsing station at your salon. I'm pretty sure Taylor wrote Speak Now and Reputation with people singing the songs in the shower in mind, ok?! This amazing lil' speaker features a detachable suction and a hook so it's easy to hang up right in the shower. Just don't immerse it into water! It also has a built-in MIC Bluetooth speaker, and a hands-free function so if someone dares to call you when you're jamming out, you can at least answer them. Plus it has a built-in rechargeable battery that supports up to six hours of playing time! 16. A mesh shower caddy that'll keep your hygiene products in one easy-to-store and easy-to-carry place. Pst, if you live somewhere with a communal bathroom like a college dorm, these are honestly an ESSENTIAL. Promising review: "It was used on vacation for about a week, and held up with no damages at all. Every item that you use to get ready for the day, including electric shaver, cologne, lotion, etc. — this caddy had slots for all items. It's sturdy and easy to carry around, plus put or hang out of the way. Dried out quickly and easy to clean." —Minnie H.
17. A rust stain remover for a quick way to get your shower back in tip-top, clean shape. 18. A fleece robe to stay cozy in when you're shivering after stepping out of a hot, steamy shower. 19. An adjustable shower bench that'll provide a steady, supportive place to sit if you're someone who can't stand in the shower, or could use a seat while performing certain parts of your routine like shaving. Can hold about 250 lbs! 20. A beverage caddy for sticking onto the wall and holding your wine, beer, or, of course, ~non-alcoholic~ beverage. Really the thirst for any sort of drink can hit at any time. Ideal to hang on glass, mirror, and glazed tile. It's made of strong, recyclable, dishwasher-safe ABS plastic. 21. A natural body wash so you can clean yourself using a clean-ingredient product. Because why would you wanna put chemicals on your skin?! 22. And while we're on the subject of clean products, a natural shampoo and conditioner set from the same company, because I assume you wanna put only the best ingredients in your hair as well. 23. A two-pack of Turbie Twists as a super quick fix when it comes to drying your hair without having to balance a huge towel twisted on top of your head. Promising review: "Before ordering these, I always used up two towels for each shower. The towel I would use for my hair would be heavy and would fall off if I bent my head slight to get dressed or what not. With this Turbie Twist, I can move my head all over and it stays put. Also, I have noticed a huge difference with my hair not frizzing as much since using the Turbie. I think the towels dried my hair out too much. I have medium/long hair and regular thickness. The Turbie gets soaked while on my head, but doesn't drip. I will never go back to using a towel for my hair again, and in fact, I'm looking for more styles to order soon." —Angie B. 24. A shower caddy to provide a super pretty spot to store your soap, razor, shampoo, conditioner, and whatever else you may use in the shower. This will fit most shower heads! 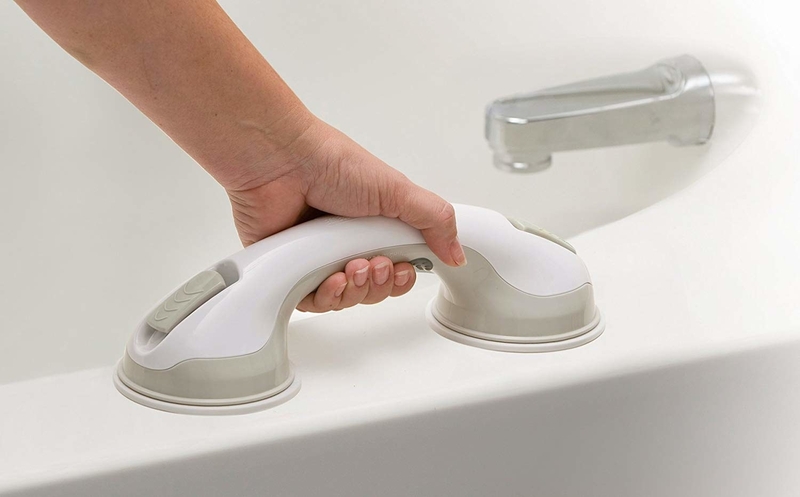 It features integrated hooks for storing razors, loofahs, brushes, washcloths, and more! It also has lower suction cups that'll stick to the shower well and prevent the caddy from moving and spilling contents. Not to mention, it has a rust-resistant finish so you can count on this baby to hold up for years to come! 25. A handheld shower head you can easily attach to your existing shower head, because sometimes you want to rinse in places too far away (or hard to access) just from standing under a wall-mounted shower head. Features a 5.5 in. diameter spray head hand shower, and six-function combination spray to ~customize~ your shower. It can be easily released and returned thanks to a magnetic docking system! 26. 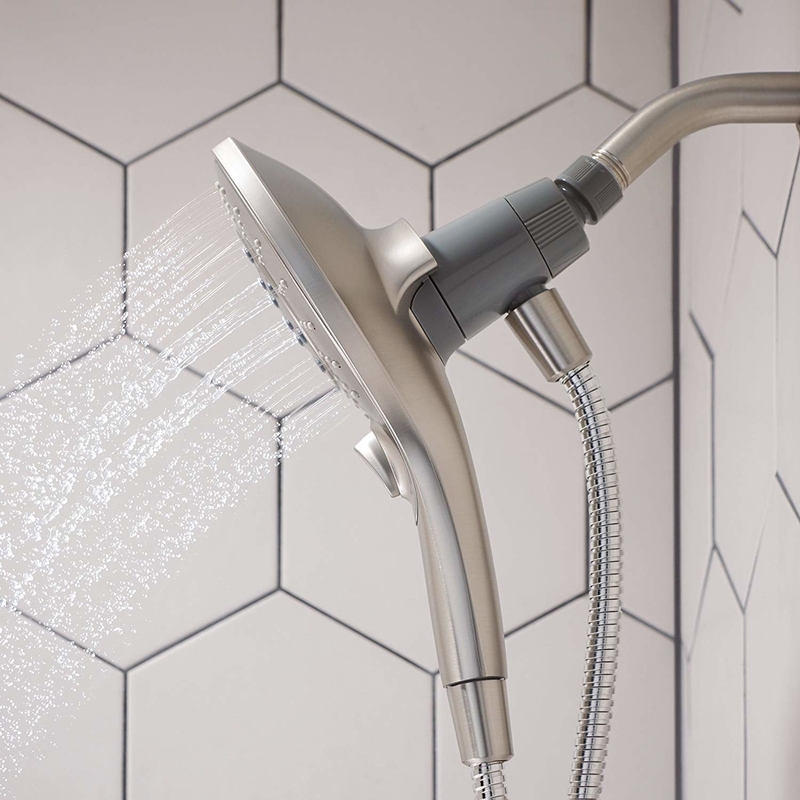 A stainless steel rainfall shower head that'll help you have the best shower ever with its superb water pressure, and it just looks majestic as heck. Made with silicon gel nozzles to prevent lime scale build-up, and so dirt can be easily removed. Features air energy technology to offer a consistent, powerful rain shower, even with low water pressure. 27. A shampoo scalp brush for giving your scalp the gift of a deeper clean, while the bristles of the brush stimulate blood flow, which in turns leaves you feeling relaxed and maybe even less stressed! 28. A four-pack of shower caps to keep on-hand for the days you don't wanna wash or get your hair wet. Not to mention, these ones are SUPER cute.